Description: This luxury one bedroom senior apartment in Round Rock, TX features gorgeous granite countertops in the bath and kitchen and contemporary carpeting in the bedroom. Description: You'll feel right at home in this one bedroom, one bath apartment at Bluffs Landing Senior Village which offers a spacious patio and additional storage space. Description: Cherry wood finished cabinets, granite countertops, and trendy track lighting create a cheery gourmet kitchen in this luxury one bedroom senior apartment in Round Rock, TX which offers a large dining area perfect for Sunday dinners. Description: This two bedroom senior apartment in Round Rock, TX offers the best features, like 9� ceilings, generous closet space, and six-panel interior doors. Description: Bluffs Landing Senior Apartments offers a spacious split, two bedroom floor plan with two baths and generous walk-in closets. 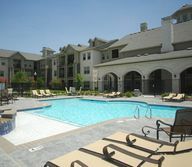 Description: Take in the beautiful Round Rock, TX sunsets from the spacious patio of this stunning two bed, two bath senior apartment.